I came across this nugget of a recipe through Pinterest. It is adapted from bakeatmidnight. I increased the quantities of the sauce and I am glad I did. The sauce of this recipe is out of this world. I served it over rice as well. Since then I have made the sauce with chicken as well. I prefer it with chicken for that matter. I will add it to my regular rotation. I have added the chicken version below. For the pork: Combine the flour, salt, pepper, and garlic powder in a shallow bowl. Dredge the pork chops in the flour mixture on both sides until well coated, shaking off any excess. Heat a skillet over medium high heat and add the butter and olive oil to the pan. Cook the pork chops 5-8 minutes on each side until golden brown. Set pork chops aside and make the sauce. For the sauce: In the same skillet you used to cook the pork add the lemon zest, minced garlic, white wine (or broth if you prefer), lemon juice, thyme, and salt. Stir with a whisk. Add the pork chops back into the skillet. Cover with a lid and cook for 15 to 20 minutes over medium heat. Remove the pork chops to a platter and keep warm. To the remaining sauce add the heavy cream and butter and stir until the butter has melted. Serve over pork chops with a side of steamed rice or pasta and veggies. For the chicken: In a shallow bowl, combine the flour, salt, pepper, garlic powder, and paprika with a fork. Dredge the chicken cutlets in the flour mixture on both sides, shaking off any excess. Heat a large skillet over medium high heat. Add the butter and olive oil to the skillet and cook the chicken 5 to 8 minutes on each side. Remove the chicken to a plate and make the sauce. For the sauce: In the same skillet combine the lemon zest, garlic, lemon juice, white wine (or broth), thyme, and salt over medium heat. Whisk to combine. Add the chicken back into the pan and cover over medium low heat for 15 to 20 minutes or until the chicken is fully cooked through. Remove the chicken to a platter and keeps warm. To the sauce add the heavy cream and butter and stir until the butter is dissolved and the cream is well stirred into the sauce. Serve the sauce over the chicken and steamed rice (or pasta) with green beans or broccoli. Categories: Main Dish, Main Dish - Chicken, Main Dish - Pork, Sauces | Tags: Chicken with Lemon Thyme Sauce, Pork with Lemon Thyme Sauce | Permalink. Okay, the Austrian’s rule in the types of Schnitzel. 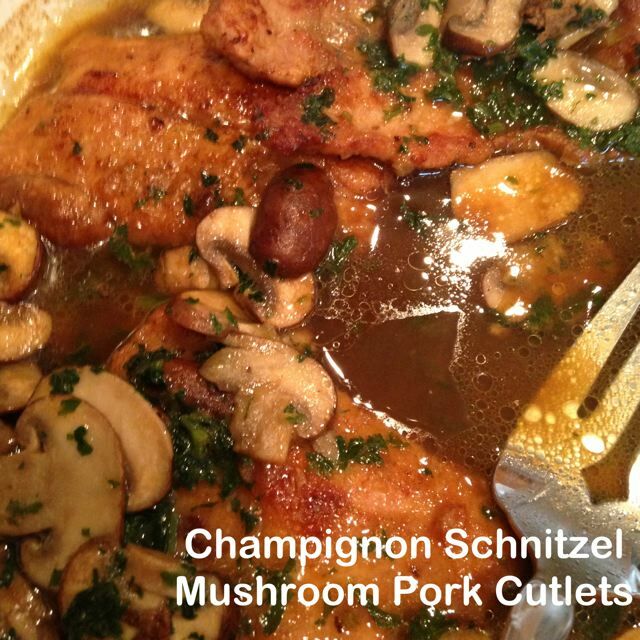 These are Pork Schnitzel (Cutlets) in Mushroom Sauce and are very good as well. I found the recipe in one of my Austrian cookbooks. I have translated it from German. Thankfully my scale will give me the metric measurements. These Schnitzel are pork, pounded thin, salted, dredged in flour on one side, browned in a pan with a little butter on both sides. Placed in a casserole to be kept warm in the oven and then served with a mushroom sauce and parsley. My husband was happy to have some German food again as I have not made any for a while. Pound the cutlets with the flat side of a meat mallet until it is about 1/8 inch. Sprinkle the cutlets with salt. Dredge them in the flour, but only on one side. Melt about 1 Tablespoon of butter in a large skillet over medium high heat. Brown the cutlets on both sides and remove them to a baking dish. Pour about half a cup of water in the skillet and use a whisk to remove the browned bits. Pour the pan sauce over the cutlets in the baking dish and put in the oven to keep warm. Repeat the procedure with remaining cutlets. Melt about 1 Tbsp of butter in the skillet and cook the mushrooms until they are browned. Add about 1 cup of water to the mushrooms and bring to a boil. Make a paste with the remaining flour and butter, mashing them in a small bowl with a fork. Add to the mushrooms and water. Simmer until the sauce has reduced by about half and is not as watery. Add the minced parsley to the sauce and pour the mushroom sauce over the cutlets that are being kept warm in the oven. Cook for about 20 minutes or until the cutlets are tender. Serve with a side of pasta, crusty French Bread and a vegetable. Another great very Austrian side would be Semmelknoedel (Austrian Bread Dumplings). Categories: Ethnic, Ethnic - German, Main Dish, Main Dish - Pork | Tags: Austrian Schnitzel, Champignon Schnitzel, cutlets, Pork Cutlets, Pork Cutlets in Mushroom Sauce, Schnitzel | Permalink. Pinterest strikes again. That site is dangerous I tell you. My husband especially loves stuffed peppers. I came across a recipe that used ground beef as well as sausage. It sounded good. And I made them with a few adaptations. The original recipe can be found here. Sad story, the first time I started to make them, I discovered that the store had sold me some sausage that had expired last month! The meat smelled “off” – as I started cooking it – my family appreciates that I quickly changed my menu for that day!! The store were kind enough to give me my money back on that item, but made not apologies for selling it in the first place, nor did I feel that they cared if I ever bought another thing at their store, so I will not be buying my meat there again (EVER). Why is customer service so hard to find nowadays? I find plenty of customer dis-service. Thanks for letting me rant! In a large skillet, brown the sausage, ground beef, 1 teaspoon of salt, and onion over medium high heat. Add the garlic the last few minutes of cooking. Drain off any excess fat. Turn off the heat. Add the cooked rice, 1/2 cup cheddar, diced tomatoes, parsley, remaining salt, and pepper. Stir to combine. Wash the peppers and split them lengthwise. Remove the stem, seed and white ribs from the peppers. Place the peppers in a casserole. Fill the peppers with the meat filling until full. Sprinkle the tops with the remaining cheese. Drizzle the peppers with a little olive oil. Cover the casserole with foil. Bake in the oven for 40 minutes at 375 F. Remove the foil and continue baking for 10-15 minutes until the cheese is melted and browned. Cool for 10 minutes before serving. This would also be great with heated up Queso if you wish. 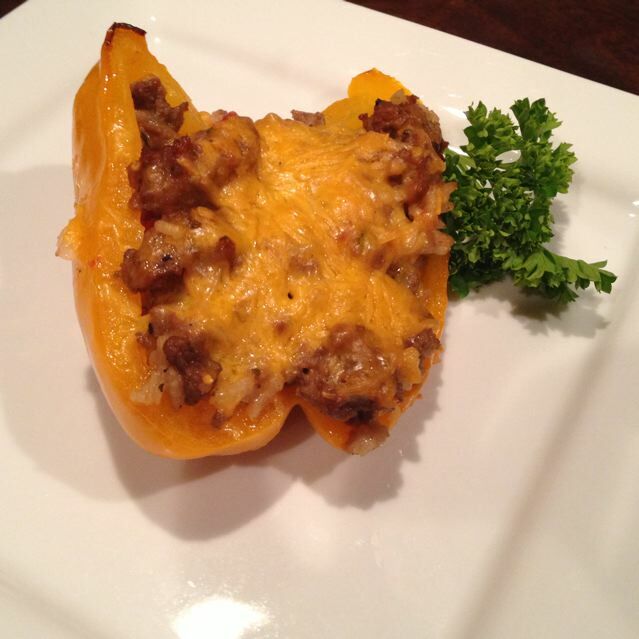 Categories: I found it on Pinterest, Main Dish, Main Dish - Beef, Main Dish - Pork | Tags: Sausage stuffed peppers, Stuffed Peppers | Permalink. I recently watched America’s Test Kitchen’s episode of crock-pot recipes. Their slow cooked pork tenderloin really caught my eye. I made it and it is quite delicious. The classic tastes of pork and cranberry really work together. It is an easy recipe too, sometimes the recipes that America’s Test Kitchen’s put out are a little fussy- this one is not! I doubled the recipe because I wanted to share some with a friend. My pork tenderloin looked like it was one large piece, but it was two smaller pieces, I tied them together, but this is optional, I think it would be fine with a few smaller ones. The meat falls apart in this preparation. I will be making it again. Heat a large skillet over medium high heat and add the oil. Brown the seasoned pork tenderloin on all sides for about 10-15 minutes total. In the crock-pot, add the cranberry sauce, dried cranberries, orange juice, cinnamon and orange peel. Stir to combine. Add the browned pork to the crock-pot. Cover with a lid and cook on low for 4 hours. Remove the pork tenderloin to a platter and cover with foil. Pour the cranberry-orange sauce into a skillet and add a slurry of water and cornstarch to thicken the sauce. 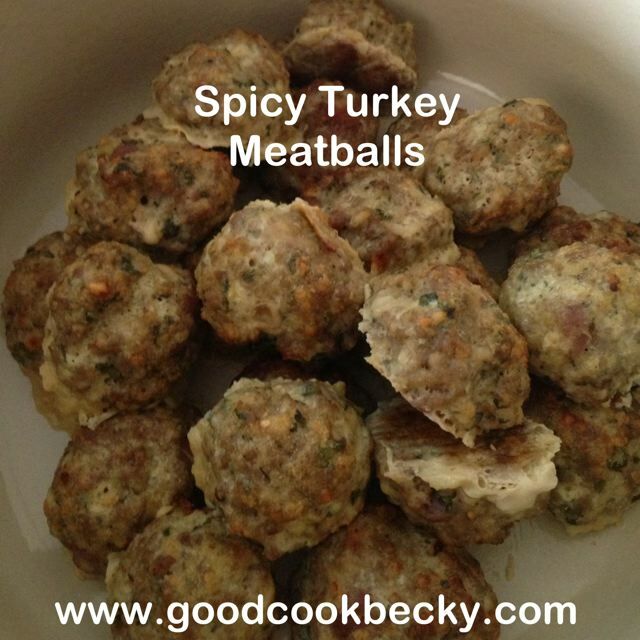 Serve with rice and carrots or other vegetable to round out the meal. 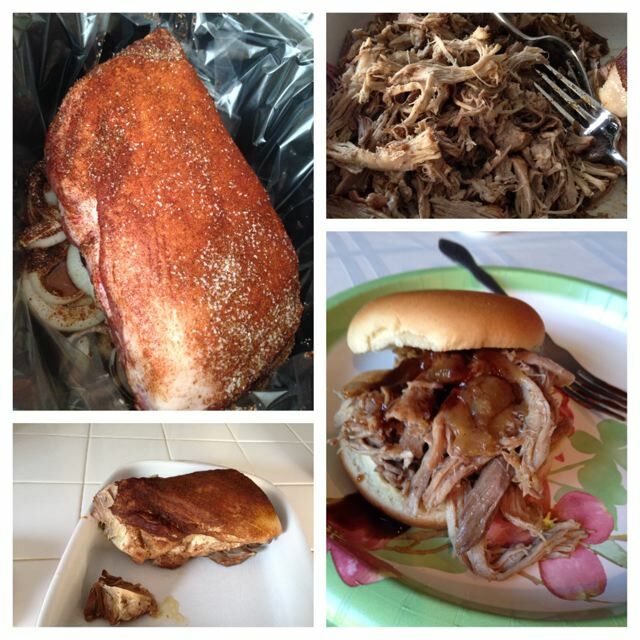 Categories: American Test Kitchen Recipe, Main Dish - Pork, Method: Crock-pot | Tags: ATK, crockpot, pork tenderloin | Permalink.